Feb. 1, 2017, 2:39 p.m.
By Shan Wang @shansquared Feb. 1, 2017, 2:39 p.m.
Is the Donald Trump era — an era teeming with existential uncertainty for the media — also an opportunity for reinvention? Reporters and editors from prominent news organizations waded through challenges of being journalists in the current political (and technological) climate at a Harvard University event on Tuesday evening. Speakers from outlets from The Huffington Post to the Chicago Tribune to The Weekly Standard shared a mix of measured optimism, cautionary tales, calls for greater empathy, and new resolve for the possibilities that lie ahead. We have posted full transcripts of the event here, but here’s an overview of some of what was discussed. Bill Kristol, the conservative political analyst and founder of The Weekly Standard, focused his remarks around three themes: disintermediation, demagoguery, and debility. The media is a mediating institution. That’s literally the case, and I think importantly the case in democratic politics. Obviously for reasons mostly technological, some of them maybe sociological and others, it’s less that today because of the Internet, social media. Social media is called social media, but when you think about it, it should be called social non-media, because this precisely removes the mediating function and it’s direct. Again, which is in many ways a good thing — but a problematic thing, I think, for politics. But in thinking about Trump, we do need to rethink a little bit, I think, our somewhat complacent view of democracy — you know, the more democracy the better, the more education the better, the more participation the better, and everything is moving in the right direction — the arc of history is going in a good way and we don’t have to worry about some of those things that the founding fathers worried about. And it’s amazing to go back and look at the Federalists — look at how many of the papers, especially the papers on the executive but also on the legislative power, are about precisely the threat of demagogues. When I speak to conservatives, I always remind them: when were the great conservative victories? Reagan in 1980, 1984, Bush 1988. Huge, lopsided victories, three of them in a row. Rush Limbaugh was not yet on talk radio. Fox News didn’t yet exist. The Internet didn’t yet exist. All these things — the conservative media didn’t exist. It really was The New York Times, The Washington Post, and three networks, which were mostly moderate-liberal at least. Nonetheless, that was the heyday of conservative policies. And incidentally, ever since Fox News took over and became such a big deal, Republicans have lost the presidential popular vote in every election but one, 2004. Katie Kingsbury, managing editor of digital for the Boston Globe, described the day the Globe decided to break down a long-cherished wall between what was seen as opinion, and what was seen as straight news. After the Orlando nightclub shooting, Kingsbury said, she went into work feeling almost numb from the frequency with which mass shootings were happening in the United States. Could the Globe approach yet another tragedy differently? One of the most amazing things about Make It Stop is that we actually saw progress from it in a rather short time. Two days later, Kelly Ayotte, the senator from New Hampshire who had received the brunt of our texts and emails, changed her vote on an important gun control measure. No, the law did not change — but she changed her vote, and it felt like a huge victory. But it also wasn’t a victory that everyone celebrated. Some of our colleagues distanced themselves from this project on social media. And a week later, I was asked to be on a panel at the Poynter Institute. I thought I was going to be talking about gun control that day. Instead, I was grilled for almost an hour about why I thought it was okay to do this — why the Globe thought it was okay to cross these lines. Those were questions that were hard to answer, that day and since. I’ve thought a lot about them. Because you’re taught in Journalism 101 some fundamental tenets: Be accurate; be fair; don’t make yourself the story. By these measures, maybe Make It Stop had crossed some lines, had gone too far. Maybe. But there are other responsibilities that we as journalists hold dear: Be a voice for the voiceless. Tell essential truths. Hold the powerful accountable. For the Globe, Kingsbury said, “a group of young people at a nightclub enjoying themselves, being mowed down in cold blood” was a tipping point. Nieman curator Ann Marie Lipinski led a conversation with Gerard Baker (editor-in-chief of The Wall Street Journal), Lydia Polgreen (editor-in-chief of The Huffington Post), and David Leonhardt (op-ed columnist at The New York Times and coauthor of the recent 2020 report). On the table was what journalism can do to regain the public’s trust, the use of the word “lie” and Baker’s continued defense of his cautionary memo against the phrase “majority Muslim country,” how best to cover a Trump administration that has rejected journalistic convention and tradition, over and over in the not yet two weeks since taking office. Lolly Bowean, 2017 Nieman Fellow and Chicago Tribune reporter, suggested a path for journalism as a unifying force, through a story about LoQuator Dinkins, a woman on the south side of Chicago. Now, I need to tell you that when I was growing up, I didn’t see reporters in my neighborhood unless there was something tragic or something violent that happened. So, in my own work, I’ve tried to make sure that I pay attention to communities and neighborhoods and try to highlight people like LoQuator Dinkins, who are doing the best that they can with the resources that they can. You see, when I’m when I write about someone like LoQuator Dinkins, a regular, ordinary, everyday person who is finding the best in themselves, I’m reminded of how great we are as people. Even as journalism is under threat from changing business models and threats from the Trump administration, CNN senior media correspondent Brian Stelter said he is optimistic about the future of news. I think those emails and the ratings and the traffic data all indicate an audience hungry, maybe even starving, for journalism right now. And that is why I reject this talkabout being post-fact, post-truth. People are watching. People are reading Lydia [Polgreen]’s Huffington Post, Katie [Kingsbury]’s Boston Globe — all of them seen huge surges in traffic. We all know about The New York Times and other outlets gaining subscribers as well. Just today, just this afternoon, while we’re sitting here, in my inbox, The Atlantic saying it set an all-time daily audience record on Sunday and then again on Monday. CNN: a million viewers every hour of the day on Sunday, again on Monday. Normally 500,000, 600,000, 700,000 is a good figure. These numbers are through the roof, online and on TV. And partly that’s because of the protests. Partly that’s because the country is hungry for information right now. “Every day is a better day for access to information. And that, I think more than anything else, is a reason for young journalists to be optimistic — not to give up on this profession, as some of them tell me they’re considering, not to fear entering the profession of journalism, just because the president says he’s at war with it, but actually to seize the opportunity. Every day, there are people who for the first time in their lives have access to a smartphone and access to our work, to our stories, to our videos. I know I made the mistake of taking that for granted sometimes. But in this moment, I’m trying to remind myself and all of you, as Bill Kristol was saying in the very beginning, this access information, this ability to reach increasingly the whole world with our content. 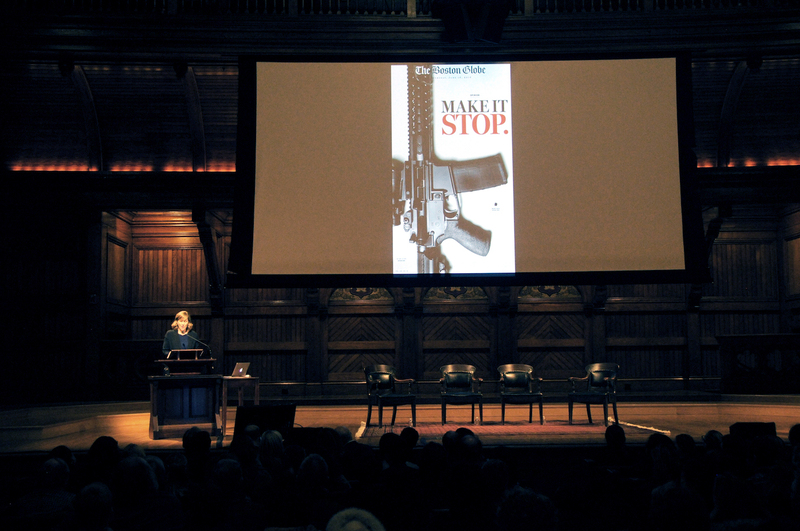 Photo of Katie Kingsbury speaking at the event courtesy Lydia Carmichael/Harvard Magazine. POSTED Feb. 1, 2017, 2:39 p.m.
Wang, Shan. "The boundaries of journalism — and who gets to make it, consume it, and criticize it — are expanding." Nieman Journalism Lab. Nieman Foundation for Journalism at Harvard, 1 Feb. 2017. Web. 23 Apr. 2019. Wang, Shan. "The boundaries of journalism — and who gets to make it, consume it, and criticize it — are expanding." Nieman Journalism Lab. Last modified February 1, 2017. Accessed April 23, 2019. https://www.niemanlab.org/2017/02/the-boundaries-of-journalism-and-who-gets-to-make-it-consume-it-and-criticize-it-are-expanding/.